This is a sponsored post for U by Kotex, who provided me products to review. 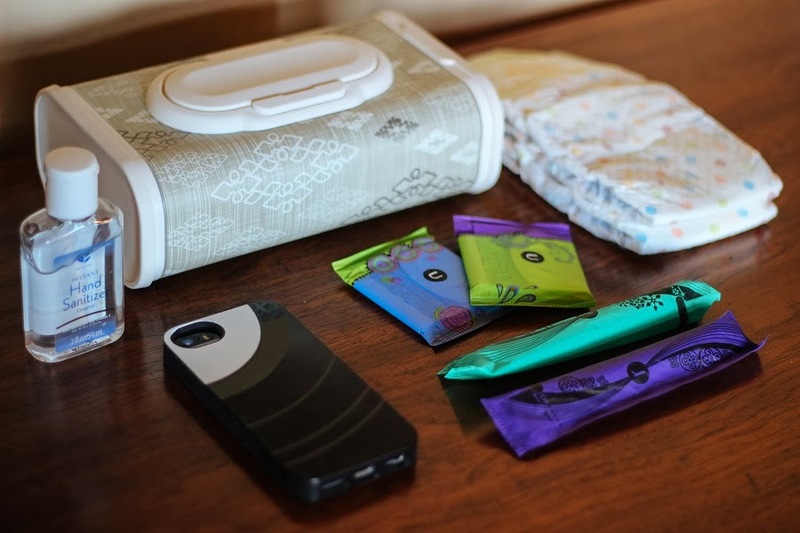 You can get a free sample from U by Kotex too at http://bit.ly/107R90y and Do the Demo. Prior to having a baby I remember preparing to leave the house being so simple. The night before I planned my outfit and readied my purse, wallet, and keys on the table. There was plenty of "me time" to get ready. A small handbag would fit everything I would need for my shopping trip, date night, or day out with friends. Flash forward 9 months and a cute baby. 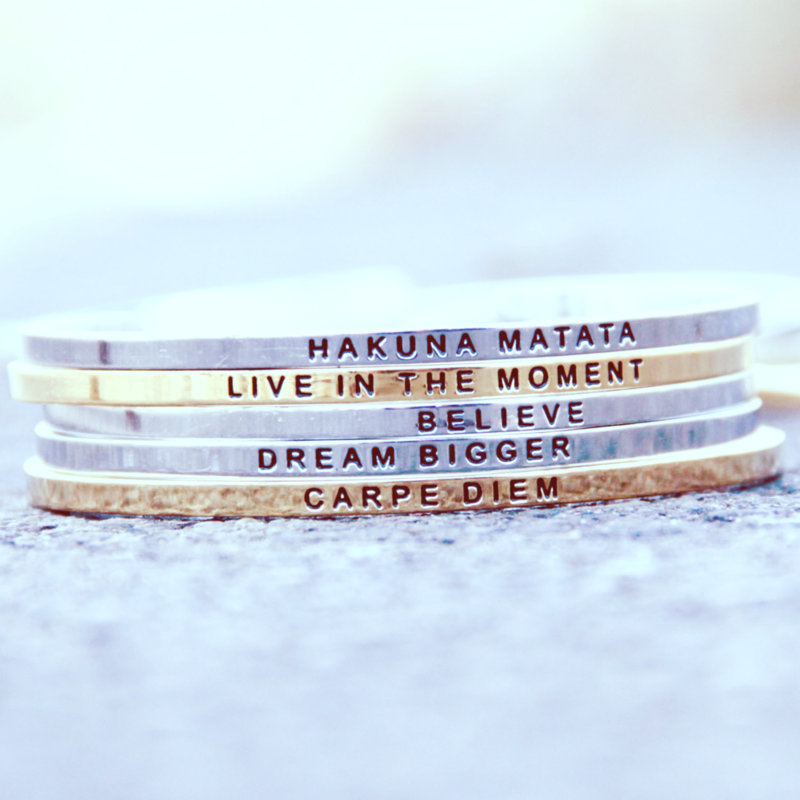 Now, my life is a completely different ball game. You need to expect the unexpected when you have a baby. Even if you have everything planned out and ready to go for your trip to the grocery store something unexpected still comes up. It usually takes at least an hour to get Zaden and myself out of the house and that is something that I'm still trying hard to get used to. I can’t imagine trying to get more than one kid ready. I don’t know how other moms manage it. With a child my small purse no longer cuts it. My essentials have changed from just having a couple of small items in a small purse to a stuffed medium sized bag. 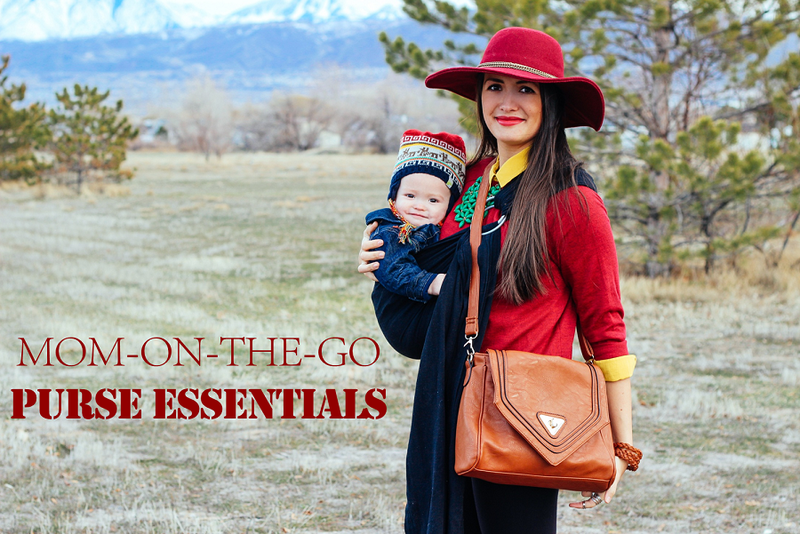 These are the top 11 essentials I think every mom-on-the-go should have on hand in order to make going out on play dates or shopping much easier and more enjoyable for both mama and baby. Diapers and Baby Wipes: I feel like this one is a no brainer. If I'm going to be out for more than 2 hours it is always safe to have a couple of diapers on hand. Even though I know Zaden's bowel movements pretty darn well he sometimes catches me by surprise. Baby wipes are also handy for quick clean-ups or wiping the cart handle at the supermarket. Hand Sanitizer: I love shopping at secondhand stores but don't love all of the extra germs. You never know where some of the clothes have been. Even though people should wash their clothes before donating them you never know if they actually do. I always have hand sanitizer in my purse so that if I need to feed Zaden a snack while we are out and about I can quickly sanitize my hands of most germs. Also comes in handy if you need to do a dressing room diaper change and aren't near a bathroom. Cell Phone: My iPhone is a must have since it's my phone, planner, and a distraction for Zaden all in one. It also works as a great camera if I want to snap a quick picture of Z.
U by Kotex Sleek Tampons: I absolutely hate to be unprepared when my period sneaks up on me a few days early. It's always better to be prepared than sorry, especially when you are out and about. U by Kotex Sleek Tampons provide the best protection and comfort for "that time of the month". Grab a free sample pack and see for yourself. U by Kotex Curves Liners: Personally I'm not a fan of pads, except for right after giving birth haha. 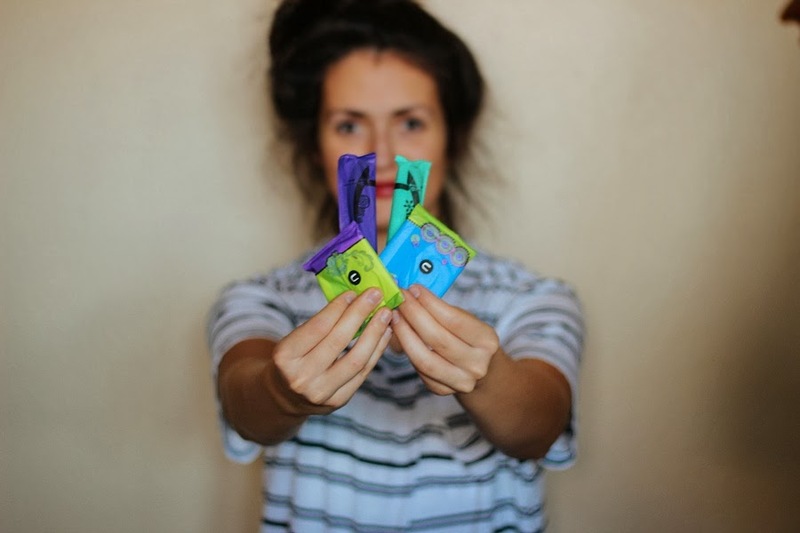 U by Kotex Curves Liners are perfect for if you are unsure of whether or not you are through with your period or want a bit of extra protection with your tampon. Wallet: I never leave the house without my wallet even when I'm not planning on driving or buying stuff. I keep all sorts of coupons and cards in there that I might need. It also comes in handy if my husband forgets his debit card. Chapstick & Lipstick: Chapstick is a must, there's nothing worse than having chapped lips while shopping. I also like to go the extra mile every now and again and put on a funky lip color just to spice things up. Nail Polish: It's impossible to paint my nails unless Zaden is asleep. If he just so happens to fall asleep in the car, I will sit in the parking lot and paint my nails really quick right before we head into the store. Snacks and Leak Proof Drink Containers: I can't stress enough why snacks are so important. Now that Zaden isn't nursing as frequently I wear clothing that is a little more difficult to nurse in without completely stripping down. I always bring snacks that won't spoil or make a big mess. It's also a good idea to bring a snack or gum for yourself so you don't feel tempted to buy fast food. I usually try and pack healthy snacks but Zaden and I have a love for chocolate. Small Toys or Keys: I usually pack a book or an old necklace that can keep Zaden busy. It's always better to be prepared than having an unhappy toddler. I recommend switching out whatever trinkets you keep in your purse from time to time to prevent baby from getting bored of any one item. 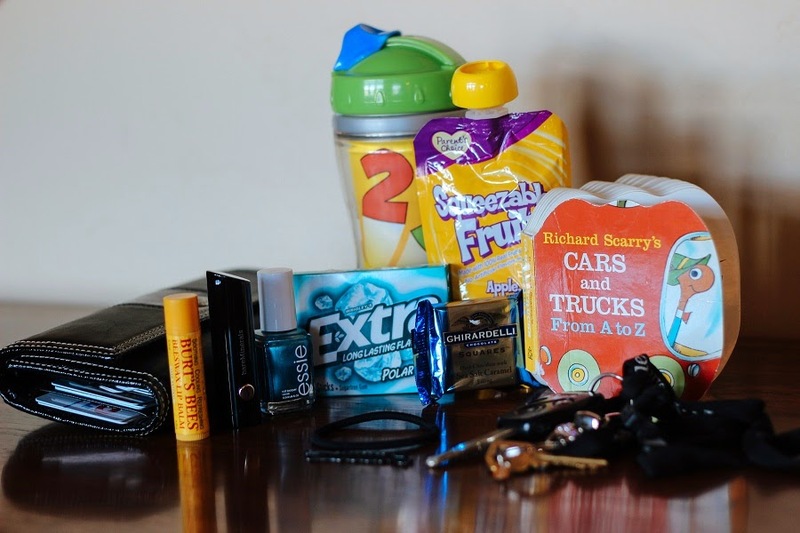 Keys make a great item if you forgot a toy or don't have anything else in your purse. Hair Accessories: Depending on where you are going it's always a good idea to have a few bobby pins and hair elastic on hand. If I ever nurse in public I usually get very warm and want all of my hair out of my face in order to feel comfortable. There you have it, 11 essentials every mama should have in her purse. What are some essentials you keep in your purse that I didn't mention above? You're lucky that your "friend" usually arrives first thing in the morning. For me, ever since it came back it hasn't really been on consistent cycle so I never know.